Glitter & Grunge Studio: Featured in "Create With Me" Magazine! 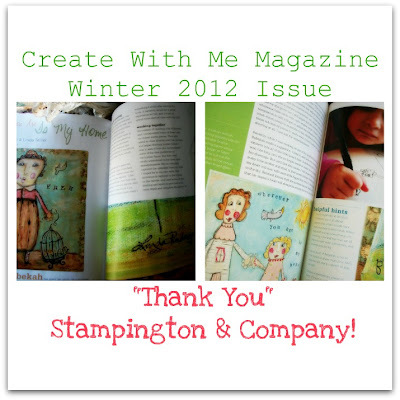 Featured in "Create With Me" Magazine! Over the moon excited to share some FAB news with all my blogland friends! I submitted an article to Create With Me magazine back in September. And today I picked up the winter issue at Michael's. I was floored to discover that the article about Rebekah and I was featured in a 4 page spread. Wowza. Now, I love each step on this art/business journey. Each one is a thrill. But this one... This one rocks more than usual. You see.... Rebekah and I have been through a lot together. I was pregnant for her when my mom was sick and dying of cancer. My baby kept me strong for my mama. Her name was the last one my mother ever spoke in this world... a gift she left to her unborn, yet already treasured grandaughter. Then, after Rebekah was born, my psoriatic arthritis returned with a hideous vengeance. My body was wracked with pain, and I could not control my legs, arms, or hands. It was a nightmare. But my amazing husband took charge of everyone and everything else in our life, while I focussed on our baby. I needed pillows propped to nurse her because I was unable to hold her securely. During those scarey days, I refused to give in. I stayed up nights with her on my lap, and learned graphic design and HTML. I started a new artistic career selling ebay templates since I was unable to create handmade items. So... although every milestone is exciting. And every publication is special. This one is a gift to my heart, and I hope to Rebekah's. I can honestly say I would not be working at this artful dream without her inspiration and patience. And it's a dream come true to share this special Create With Me article with her. Speaking of dreams come true. Remember my New Year's "resolution"? ACTION!!! That one little word has had big consequences in my life. Try it!!! Let go of everything that is holding you back. It's more than believing in yourself. It's moving forward, even in doubt. It's growing, accomplishing, learning, BEING all we are created to be. ACTION... a good word. 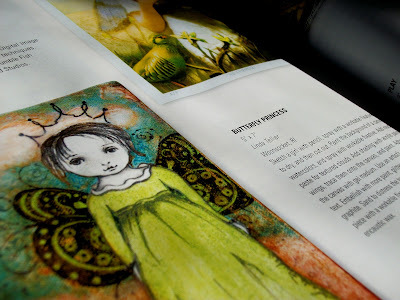 I also have a painting in the Somerset Studio January/February 2012 issue! So cool to be there among so many friends, teachers, and admired artists! I love, loVE, LOVE this online art community!! !